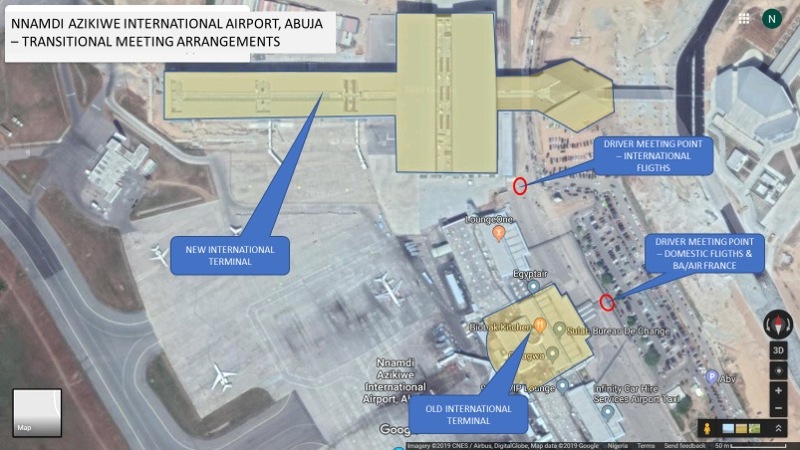 International airlines are transitioning operations to the new international terminal at Abuja airport. All international airlines except British Airways and Air France have moved their operations. The move date for BA and Air France is yet TBC as they reportedly have some operational/security concerns regarding the new terminal. The old terminal arrival and departure procedures remain extant for BA and Air France until further notice. Arriving passengers into the new terminal need to follow signs to ‘Domestic Departures’ once they leave the arrivals hall. This will bring them outside the building where they should then find their ‘meet & greet’ drivers (see diagram below) For the time being and until the car park and airport rail terminal developments have been completed, this exit point is also the entry point for passengers departing via the new terminal.